We are a traveling tournament club playing a rotating schedule. We play on many of the top courses in the greater Seattle area. Membership is FREE of charge. An active GHIN number is required. You can play as many, or as few, tournaments as you like. You must signup for each tournament you play in. We have a season long points race. 1st $150, 2nd $100, 3rd $50. We have a WSGA qualifying 2-Day Club Championship. You pay your own greens fee + tournament fee. We are sponsored by Pro Golf Discount Stores. Our sponsor pays 29% of your tournament fee. You pay a $25 tournament fee. Pro Golf adds $10 to your fee. Your $10 add-in breakdown: $6 tournament, $3 two KP Holes (for everyone), $1 end of season progressive pot. We pay out 100% of total tournament fees. 40% of field gets paid. We pay a gross and net split of 20/80. All prizes are proshop credit at Pro Golf Discount Stores. Your book money never expires. The Golf Tournament Schedule will change. We strive for the best possible golf tournament condition by scheduling around course maintenance and aeration schedules. $25 + $10 Pro Golf Add-in. 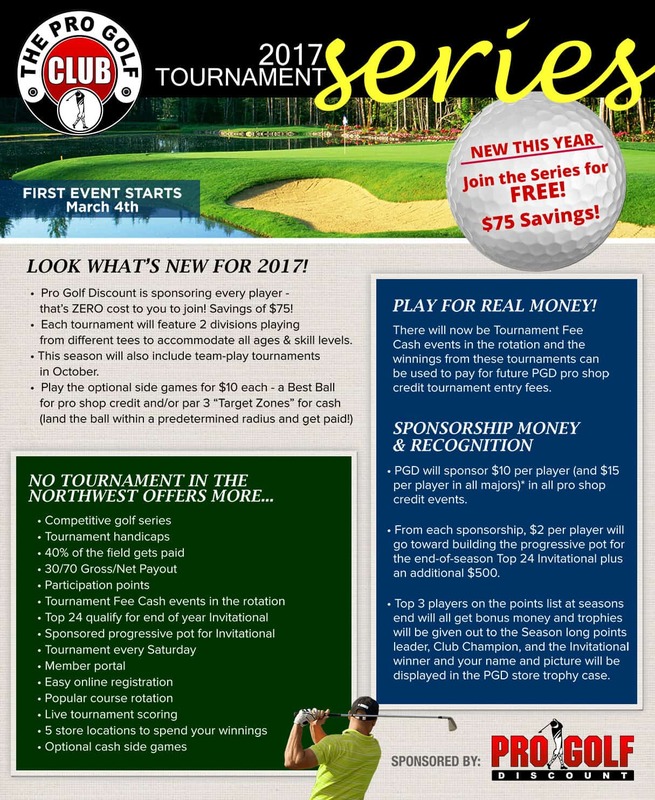 You pay your own greens fee + $25 for the tournament pot. Pro Golf Discount adds an addition $10 to the pot. It’s great deal. We payout 100% with full transparency, paying both gross and net. Winnings are redeemable as proshop credit at Pro Golf Discount golf stores.